In a decade between 2001 and 2011 the amount of total outstanding mortgage debt in Canada has increased by nearly 140%. There are many factors that led to this dramatic increase in a mortgage debt. One of them was population growth. In ten years the population in Canada increased by 3.5 million people, increasing from 30 million in 2001 to nearly 33.5 million in 2011. The number of households grew by more than 1.7 million. As the Canadian population increased by roughly 12% in a decade, fueled mostly by immigrants, one can surely expect that mortgage debt has also increased as new citizens of the country purchased houses which are mostly financed by mortgages. 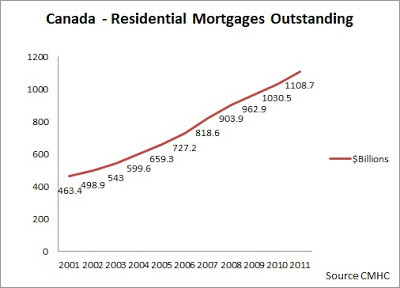 Another reason for the increase in total outstanding mortgage debt in Canada was the increase in home-ownership rate. Between 2001 and 2006, the Canadian home-ownership rate increased from 65.8% to 68.4% respectively. The 2011 census number for home ownership rate is not out yet, but it is widely believed that it is above 70%. Finally, we have rising home prices which is arguably the biggest factor in a humongous 140% growth of mortgage debt in Canada. The Teranet nation wide index has more than doubled in a decade. Specifically the Teranet index rose 105% in ten years. In sum, all of the above factors are inter-related and together they led to mortgage debt almost doubling and a half. However, let's not forget about the low interest rates which masked the short term cost of debt. For years Mark Carney, Governor of Bank of Canada, was warning about debt, yet no one ever listened. Some may say that he should of increased interest rates.... Well he didn't, so it is what it is. 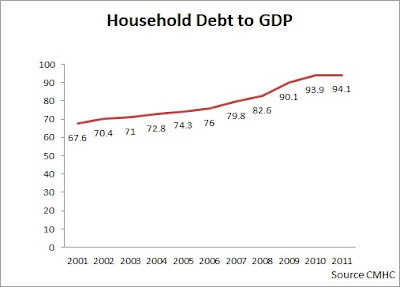 Household debt has increased by over 30% of GDP. No wonder Carney told us that Canadians as a whole were running a collective deficit for a decade. Now remember those were the good years. Below are some charts that I have made for a better visualization of this issue.